Chennai is a victim of man-made disaster. Its soil and rock types suggest that the city is historically a flood plain, says Chennai-based research Institute, Care Earth. The city is dotted with wetlands and natural channels where excess water from the city that is essentially a very flat area can be drained off. 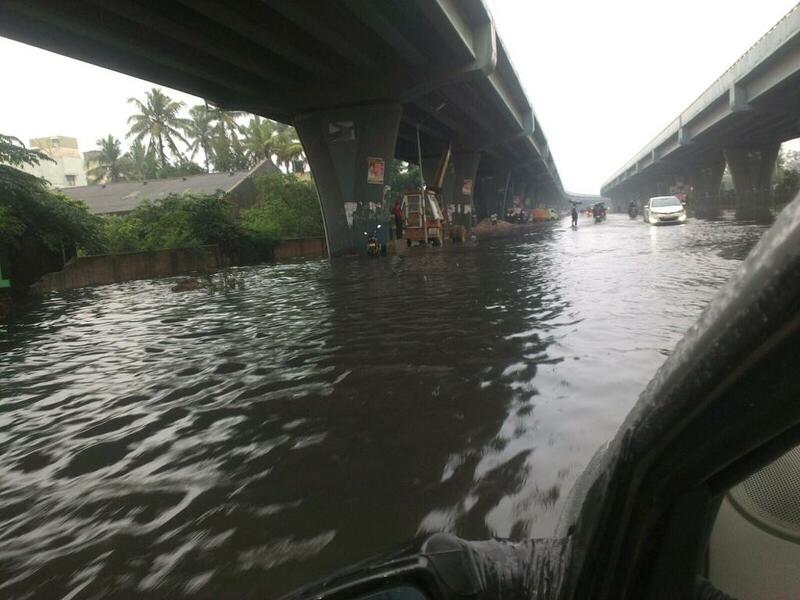 Currently, the city in Tamil Nadu is experiencing rains that have broken a record of about hundred years. With more rainfall in store, the city needs to relearn its water management system. The city that is bordered by the sea in the east and the state of Andhra Pradesh in the north could grow only in the west and south. In 2000, southern Chennai became an information technology hub. In the process of expansion, the city engulfed several fishing and agricultural villages and hamlets, thus paving way for several ecological and environmental challenges that the administration could not tackle. By 2011, the city corporation area increased four times its original size, says a 2014 report by Indian Institute of Science, Bangalore. The Chennai Metropolitan Area (CMS) has a size of 1,189 sq km and comprises of eight districts, including the Chennai city district. The population has increased from 5.8 million in 2001 to 8.9 million in 2011 in CMA. Industrial developments and establishments at Sholinganallur and Perugudi, Special Economic Zone (SEZ) at Ennore and Nadambakkam attracted many investors to Chennai. The city almost changed to a concrete jungle. The open areas decreased drastically and the built up and paved areas, according to an analyses by IISC, increased from 29.53 per cent in 1991 to 64.4 per cent in 2013. There has been total disconnect between hydrology and urban planning in the city that has been experiencing a drop in water table, with saline intrusion due to unplanned extraction of groundwater. Moreover, the groundwater is highly polluted due to unplanned solid waste dumping; the effluents leached from these solid heaps and contaminated the groundwater. The recharge structures like lakes, tanks, ponds and other wetlands in the city have been disregarded and the natural course of water has been tampered. This is one reason for urban flooding in the urban and peri-urban areas. The city has large marsh in the south (about 20 km south of the city centre), smaller satellite wetlands around it and large tract of pasture land. The southern marshland called Pallikarni marshland is known as the flood sink area of the city as it drained about 250 sq km of the city in the eighties. The marshland is housed in CMA. There were smaller wetlands around the marshland that served as a source of irrigation in the area that cultivated only paddy. The marshland that was around 5,000 hectares (ha) during independence got reduced to almost 600 ha around 2010-11. The only reason for all this was rapid urbanisation. During this time, along with the marshland, all other wetlands of Chennai became sites of waste disposal, housing, commercial and industrial purposes. As the city expanded in the south, Pallikarni marsh became fragmented. As any other city, the state of Tamil Nadu only valued the land and not the water body which came to be treated as wasteland. The city found this marsh most suitable place for urban development. The area was allotted to the Mass Rapid Transport System of the Ministry of Railways, the National Institute of Ocean Technology, the Chennai Corporation, and the Centre for Wind Energy Technology. In 2002, a survey by the Tamil Nadu Pollution Control Board showed that that the marsh lost around 90 per cent of its original extent. This is also the year when the city observed a big flood event. The most affected areas were the adjoining areas around the marsh. Citizens started movement to save the marsh land. According to Sakthivel of Department of Geography, University of Madras, this marshland is also helpful in recharging the natural aquifer in the region. Sakthivel also explains that the groundwater in the marshland is highly polluted due to garbage dumping in the marshland area. For example, the most prominent Perungudi dump yard that spans over 75.22 ha is located on the north-eastern part of the marsh. The area of the dump yard has doubled over the last decade with an increase from 32 ha in 2002-03 to about 75 ha in 2013, according to Tamil Nadu State Land Use Research Board. The Board also shows that in addition to the sheer location of the dump yard within the wetland, the edge effect of the dump yard has been increasing from 2.34 ha in 2002, leading to a loss of 51 per cent of the wetland. The research by Sakthivel shows that around 273.50 ha was allotted to different institutions by 2010. Over and above this, there are other allotments that made the total allotment area of 474 ha area already allotted or occupied. Can we stop this devastation? The conversion of wetlands into lands for other purposes was very easy in the state until it amended the Tamil Nadu Town and Country Planning Act to prevent the conversion of wetlands for other purposes. Under this act, the permission of conversion of wetlands to other residential purposes is to be done by district collector and not the tehsildars, as before. But this did not stop the encroachment of the wetlands, say the citizens. The 2014 analyses of IISC showed that in just past four decades the urbanisation increased almost 20 times at the cost of open and green areas. The areas got converted to urban impervious surfaces that increase the runoff and create water logging in absence of proper drainage. The research suggested use of analytical studies of urban sprawl in the city of Chennai with the help of remote sensing data. D M Mahajan of University of Pune who had studied the effects of changed land use pattern of wetlands of Pune, Maharashtra, in 2014, said that a better understanding of aquatic ecosystem is needed to enable development of best management practices, thus transforming the way the land and water are being used. He also explained that rapid changes in habitat and land use are major threats to wetlands. This needs proper management plan for restoration of wetlands at landscape level. The unplanned urbanisation not only makes a city prone to urban flooding but also decreases its groundwater recharge. The researchers of Indian Institute of Roorkee in 2014 studied the effect of change of land use on groundwater recharge. They commented that proper planning and management is required for aquifer recharge. It further says that there is a need to understand the land use pattern in the past and present to understand the potential changes. Professor Saswat Bandyopadhyay, Head of Department of Environmental Planning, Centre for Environmental Planning and Technology University, Ahmedabad, says that the devastation occurred due to complete disrespect of basic urban planning and hydrological cycle. The city needs to rework its urban planning and the planners need to go back to their board and think of resilient planning along low lying areas. The water channels that can be made encroachment-free should be restored at war footing. Around Rs 400 crore has already been pumped in for stormwater drainage network in the city under Jawaharlal Nehru National Urban Renewal Mission. But the high intensity rainfall indicates that the design exercise of the drains has been messed up. The rain intensity was very high as compared to peak intense rainfall of last 30 years, based on which the diameter of the stormwater drains is calculated, says Bandyopadhyay. Hence, the drains are incapable to carry the runoff and the only saviour to such problems can be good urban planning along with hydrological understanding opines the planner. Excellent article. Yes Chennai floods and devastation is mostly man made and a consequence of human's greediness. Of late with access to power and money anything can be done. Encroachments,no proper sanitation and unplanned multistoried buildings areas without proper compliance of drainage in the neighbouring places are some of the reasons for the disaster. It is the same in Andhra Pradesh as witnessed in Floods in Nellore and Chittoor Districts. Unless remedial measures are taken on a war footing the future of Chennai is at stake. Why could not the IISC predict all these before the flood as it could have saved a huge loss. What a waste !!! The underlying problem around all such "man-made disasters" is on one level quite straightforward. There is near total disconnect between common sense and decision making; between science based evidence and policy making and above all between ethics and governance. As long as our enlightened voters continue to vote for all sorts of obscurantist reasons, like a leader must have been a film star and so forth, please let's prepare for worse man-made disasters. But there's lots of money in floods. No? Saving wetlands is critical. Need to strengthen the laws that protect wetlands against short sighted development agenda.